If a bus leaves Steubenville, Ohio, at 9 a.m. to travel 40 miles to Moundsville, WV and breaks down after 15 minutes on the road, what time is it? Today, one could say with relative certainty that it is 9:15 a.m., but prior to 1966, travelers could have concluded that they had gone back in time after realizing that local clocks read 8:15 a.m.
That infamous 35-minute bus ride along West Virginia Route 2 caused passengers and drivers to change their watches seven times due to inconsistencies in state, city and town daylight saving laws that produced a clock time unique to each area. This and other conditions of irregularity eventually led to the passage of federal legislation that standardized time, based upon a concept created by one of our founding fathers more than two centuries earlier. Writing by candlelight, Benjamin Franklin first thought of daylight saving time (DST) in 1784 after realizing turning the clock back an hour would provide an extra 60 minutes of sunshine in the evening and would delay the need for burning lanterns. His idea did not gain mainstream acknowledgment until William Willett wrote the “Waste of Daylight” in 1907. Shortly thereafter, during World War I, Congress chose to establish standard time zones (Pacific, Mountain, Central and Eastern) and a daylight saving time for the summer months. However, daylight saving time received such opposition from farmers whose daily schedule corresponded with the sun’s rise and fall that it was repealed by congressional override only one year later. World War II sparked a three-year national daylight saving time movement called “War Time” as a way to conserve electricity. Following the war, the federal promotion of DST dissipated and it was left to localized governments to decide which standard to adopt. Consequently, from 1945 to 1966 the lack of national regulations led to several bizarre and unfavorable occurrences, such as the year that Iowa had 23 different DST start and end dates in different parts of the state, resulting in botched dinner reservations and sparsely attended company meetings. The first action by the West Virginia Legislature to establish daylight saving time was in 1963, when lawmakers passed House Bill 14, authorizing the Governor to annually designate DST as the official statewide time from the fourth Sunday in April to the fourth Sunday in September. Three years later the U.S. Congress, recognizing the need for uniformity, enacted the Uniform Time Act of 1966, which invalidated any previously passed state laws concerning daylight saving time and mandated that any state that chose to observe DST must set its clocks ahead an hour on the last Sunday in April and turn them back on the last Sunday in October. After the law went into effect, members of Congress received protests from farmers who objected to doing chores in the morning darkness, from drive-in movie proprietors, from early-to-bed, early-to-rise communities, and from the mothers of children who would not sleep until the sun went down, according to a 1967 New York Times article. The Uniform Time Act allowed states to pass legislation to forgo daylight saving time in favor of year-round standard time, but they could not make any alteration to the federal guidelines. Arizona, for instance, is one of a handful of states that does not go by daylight saving time. However, advocates of daylight saving time argue that it conserves electricity, protects children from darkened school bus stops in the morning, and encourages evening exercise outdoors. While states are allowed to decide whether to employ daylight saving time, they vary as to whether a governor’s executive order or legislative action shall decide which option to choose. Prior to the passage of Senate Bill 36 in 1978, West Virginia required an annual proclamation by the Governor that the state would follow daylight saving time; the new legislation removed that requirement and mandated the official state time. Over the last two and one-half decades, the length of time the country observes DST has steadily increased, and in special circumstances it has been extended well beyond its designated duration. Facing the 1973 energy crisis, President Nixon declared that DST would be observed for 15 consecutive months. An amendment to the Uniform Time Act in 1986 established the time period that has prevailed over the last 21 years -- the last Sunday of April to the last Sunday in October. That tradition will be tested this spring in accordance with the U.S. Energy Policy Act of 2005, which moves the beginning of DST up six weeks to the second Sunday in March and the end back one week to the first Sunday in November beginning this year. A number of reasons are cited for the modification, such as energy savings, oil conservation as well as decreased violent and traffic offenses. Though, the federal government still reserves the right to revert back to the 1986 rule if the change is not well received or does not save a substantial amount of energy. One potentially unwanted effect of this legislation is technological glitches, in what some are calling a “mini-Y2K.” Older computer systems, cell phones, personal digital assistants, etc., are still programmed to change on the dates and times set by the 1986 amendment. Issues of inconvenience will likely occur such as manually changing the time this Sunday on electronic devices, as well as changing them back again when they automatically switch in April. According to communication technology staff at the Legislature, this new shift will only cause minor problems for lawmakers and personnel at the Capitol. Staff has been working diligently for the past several weeks to update all computers with software patches designed to let the machines adjust automatically to the new start and end dates. Lawmakers in both the Senate and the House have been burning the midnight oil in anticipation of the final day to complete legislative action, holding floor sessions twice a day and committee meetings that do not adjourn until well after dark. This Saturday, March 10, when the clock strikes 12 a.m. and the gavel goes down, the 78th Regular Legislative Session officially will end. Two hours later, the East Coast, in synchronized fashion, will turn clocks forward an hour, just as lawmakers this session have worked together to pass legislation which will move the state forward toward a better future for generations to come. Perhaps the lengthened summer daylight hours will help shed some light on the long nights to come at interim meetings this spring and summer, and continue to shine brightly upon the beautiful state of West Virginia. Senate Bill 18 will require insurance providers (both the Public Employees Insurance Agency and private companies) and Medicaid to cover the costs of medically necessary kidney screening. The screening will include any combination of tests recommended by the National Kidney Foundation - specifically, blood pressure, urine albumin or protein, and serum creatinine tests. Senate Bill 66 will set a flat fee of $2.50 per day for people in home confinement. The fee was previously set at no more than $5. Money collected from this fee will go into the state Community Corrections Fund. Senate Bill 70 will penalize contractors and subcontractors who knowingly employ illegal workers. The penalty would include fines from $100-$1,000 for the first offense; $1,000-$2,000 for a second offense, plus a 3-month suspension of the contractor’s license; and $3,000-$5,000 for a third offense. Senate Bill 104 will establish that all public retirement plans under the Consolidated Public Retirement Board must make annuity payments by the 25th day of the month, except for December, when payments will be due on the 18th. If the payment day falls on a state holiday or weekend, the payment will be due the next business day. Senate Bill 105 will impose a penalty on county commissions that are late in making payments owed to the Deputy Sheriff’s Retirement Fund. This fund is paid for by fees collected by sheriffs for performing certain services, including background checks, fingerprinting and motor vehicle identification. The penalty will be the value, with interest, of the fees that have yet to be transferred into the Fund, with a minimum penalty of $50. Such payment must be paid by the 15th day of the month following the service fee due date. Senate Bill 134 will require employee contributions and a detailed summary of those contributions be submitted by the member’s employer to the State Teachers Retirement System within 15 days following the end of the calendar month. Senate Bill 180 will allow retired public safety officers who are participants or members under the retirement plan administered by the board, to voluntarily elect to have amounts from an eligible retirement plan distributed in order to pay for qualified health insurance premiums. The dollar amount of theses distributions may not exceed $3,000. Senate Bill 181 will amend current law to provide members of the Board of Banking and Financial Institutions compensation in line with the Legislative per diem pay. The bill increases board members’ per diem pay from $50 to $150 and also specifies that reimbursed expenses must be actual expenses. Senate Bill 217 will extend the time for Piedmont City Council to meet as a levying body. The bill allows the council to meet as such a body from March 7-28, 2007 and from April 17, 2007 to May 31, 2007. Senate Bill 387 will provide that an honorably discharged veteran may not be denied the opportunity to have a bronze military grave marker placed on his or her gravesite. Senate Bill 413 will clarify procedures for seizing abandoned, neglected or cruelly treated animals. If found with life threatening conditions, a licensed veterinarian would determine if the animal should be euthanized. If a magistrate is not convinced an animal was neglected or cruelly treated, then the magistrate may dismiss charges and return the animal to its original owner. Senate Bill 414 will raise the fees charged by circuit clerks for various services, such as garnishing a person’s salary and executing a property seizure to meet the payment of a legal judgment. Senate Bill 416 will create misdemeanor penalties against a person who knowingly attempts to defeat a drug or alcohol screening test, as well as penalize distributors of a product that can defeat such a test. Substances that might alter a urinary or other fluid sample to give a false result include: Bleach, Chromium, Creatinine, Detergent, Glutaraldehyde, Glutaraldehyde/squalene, Hydrochloric acid, Hydroiodic acid, Iodine, Nitrite, Peroxidase, Potassium dichromate, Potassium nitrate, Pyridinium chlorochromate, and Sodium nitrite. Upon the first offense, a person could be fined up to $1,000, with an increase to a $5,000 fine for the second offense. The third and subsequent offences warrant up to a $10,000 fine and/or up to one year in a regional jail. Senate Bill 442 establishes a new grievance procedure for West Virginia public employees, and creates the West Virginia Public Employees Grievance Board. The new board would consist of five members who are to be appointed by the Governor. It also gives the board new powers, duties, rule-making authority and data collection responsibilities in an effort to make the grievance process more fair, efficient, cost effective and consistent. Senate Bill 489 relates to the duties of the Workforce Investment Council in the development of a strategic five-year state workforce investment plan that would attempt to establish a public agenda with goals of promoting the success of the state. The main goal of this legislation is to find jobs for PROMISE scholars in West Virginia. Senate Bill 603 will establish the 21st Century Tools for 21st Century Schools Technology Initiative. The bill states the provision of technical equipment and services to students and teachers must be based on a plan aligned with the goals of the West Virginia 21st Century Strategic Technology Learning Plan. This program will give students, grades prekindergarten through twelve, the knowledge and skills needed to succeed in the twenty-first century. This bill will replace and enhance current technology programs to allow West Virginia students to develop proficiency in content, technology tools and learning skills. Senate Bill 607 will amend several provisions of state law relating to the election of political party executive committees and the filling of vacancies on these committees. Among these provisions, the bill: provides that if the newly elected executive committee meets before July 1, the new committee will serve the remainder of the outgoing committee’s term and is authorized to conduct business; authorizes the chair of the state executive committee to fill a vacancy if the county chair fails to act and the failure to fill the vacancy prohibits the district committee from conducting business; and, requires the county clerk to submit the results of executive committee elections to the Secretary of State. Senate Bill 618 will require the certificate of announcement for write-in candidates to be filed within 42 days, rather than 21 days, before an election. Senate Bill 641 will define the term “Public Service Commission motor carrier inspectors and enforcement officers” for purposes of inclusion into the criminal provisions concerning malicious and unlawful wounding, battery and assault. Senate Bill 708 will make changes to current law dealing with the registration of charities. This bill will clarify that solicitation and receipt of donations and grants is the same as solicitation of funds for purposes of determining which organizations are required to register as charities. House Bill 2712 requires the Commissioner of Banking, along with the West Virginia Board of Banking and Insurance, to apply similar standards to that of federal bank regulators. The Commissioner and Board will have to determine whether a bank will present a significant concern or raise a legal or policy issue when the bank is filing the application that establishes the bank branch. House Bill 2870 allows courts to order payment into the Domestic Violence Legal Services Fund under certain circumstances. A court can force the losing party of a lawsuit to pay an amount equal to the attorney’s fee into the fund in the following situations: when the losing party is required to pay an attorney’s fee; or, when the losing party’s lawyer tells the court that the party will not be charged a fee. House Bill 2973 declares certain claims against the state of West Virginia to be moral obligations of the state. The State Auditor will authorize payments to organizations and individuals who have filed claims resolved by the Court of Claims. The money paid to the complainants will come from the general revenue fund. House Bill 2988 relates to the West Virginia Tax Procedure and Administration Act. This bill defines what a return is for the purpose of aiding the administration of taxes. House Bill 2990 makes technical corrections to assure the proper collection of offset fees. The bill changes Internal Revenue Service (IRS) to Tax Commissioner since the Tax Commissioner imposes offset fees, not the IRS. House Bill 3073 prohibits financial institutions, state banks or out-of-state banks from establishing or maintaining a branch in West Virginia on, or within, one-half mile of the premises or property of an affiliate if the affiliate is engaged in commercial activity. For this bill, commercial activity means activities in which a bank holding company, financial holding company, a national bank or national bank financial subsidiary may not engage in under federal law. House Bill 3090 transfers the Weston State Hospital Institutional Farm, located in Lewis County, from the Department of Agriculture to the Department of Health & Human Resources. The Department of Agriculture will retain the oil, gas and mineral rights. The Department of Health & Human Resources will now be authorized to sell, lease, donate or transfer the property only if the communication tower, located on the property and owned by the Lewis County Commission, can stay free of any costs. House Bill 3117 requires all contractors submitting a bid with the State of West Virginia to have a state contractors license. Before the passage of this bill, only people performing contracting duties in the state had to have a state license. March 7, 2007 was the Division of Natural Resources’ Wildlife Diversity Day at the Capitol. 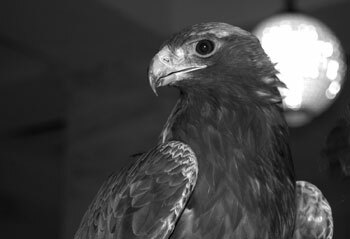 One of the main attractions was Spirit, a four-year-old male Golden Eagle who was taken in by Three Rivers Avian Center in Brooks, West Virginia. Due to the severity of the injury to his back talon, Spirit cannot be returned to the wild and the center has raised him since his rescue two years ago. The Three Rivers Avian Center is an animal shelter for injured and endangered wild birds, raptor rehabilitation and environmental education programs.